Having weird food cravings when you’re pregnant is practically a rite of passage in North America. Some of them become the stuff of urban legend- strawberry ice cream with beef jerky anyone?! The influx of hormones, combined with the task of eating for two, seem to give Canadian women the right to send their partners out into the cold to fetch whatever “baby wants” at that moment. But for most of the rest of the world, eating whatever you want isn’t that simple, even during pregnancy. In Ethiopia, low dietary intake, and a lack of nutrients in the diet are very serious problems. Maternal nutrition is one of the key factors in preventing pre-term birth. In a country where pre-term birth is the 8th leading cause of death, this means that food cravings take on a whole new meaning. Demekeen has improved her nutrition through a kitchen garden, where she grows carrots, spinach, and more. Ethiopia is one of three countries that are the focus of Born on Time, a public-private partnership to prevent pre-term birth. Born on Time includes World Vision, Save the Children, Plan International, Johnson & Johnson and the Government of Canada. It is first partnership of its kind to focus intently on prevention by addressing the key factors that contribute to preterm birth: Unhealthy Lifestyles, Maternal Infections, Inadequate Nutrition and Limited Access to Contraception, or LINC. What keeps women from eating well? 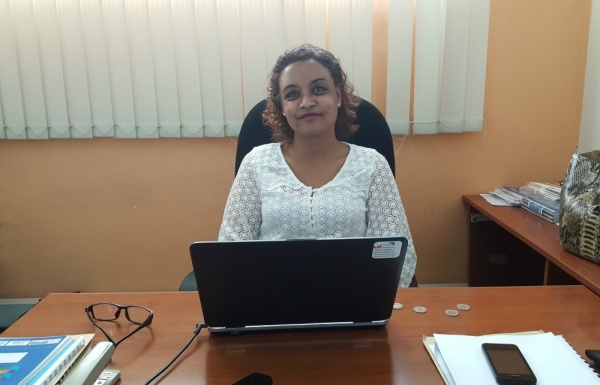 Hibret Getaneh, the Technical Advisor for Born on Time in Ethiopia, says that there are many reasons that rural women are not getting the nutrition they need. Hibret Getaneh at work in Ethiopia. A lack of decision-making power and low literacy levels can prevent them from receiving and understanding information about nutrition, and making the best decisions regarding their own nutrition during pregnancy; Discriminatory social norms in which men (and sometimes boys) receive preferential access to meat and other nutritious foods prevents women from being able to eat what they need for a healthy pregnancy. “There is a tendency for women to eat smaller portion than other household members, especially the men and boys. The mother is the last to eat, even if she is pregnant,” Getaneh says. The food that women do eat is often simple carbohydrates. Mothers in rural areas often don’t understand the need for variety in their diet, and how important those nutrients are when she is pregnant. The result is disastrous. According to a 2016 Ethiopian Health Survey, around 24% of women ages 15-49 in Ethiopia have some form of anemia, or a lack of hemoglobin in their blood stream. This leads to complications with birth, and health issues for babies, and can even cause pre-term birth. There is yet another factor that prevents pregnant women from getting the nutrition they need. There are around 260 days of the year that Christians in Ethiopia are expected to fast. Although religious leaders don’t expect pregnant mothers to participate in fasting, women will nonetheless do so out of fear of what their neighbours or husbands might say if they don’t, says Hibret. To combat all these factors in mothers’ nutrition levels, Born on Time programming is implementing a multi-pronged approach. It starts at the community health worker level, Hibret explains. When women receive ante-natal care at the beginning of their pregnancy at health facilities, they are educated about the importance of a holistic diet. Community health workers also bring the message of nutrition and diet to women’s homes during door-to-door visits. The Ethiopian government supplements this education by offering six months of free nutrient supplementation through tablets and capsules. The second tactic aims to address harmful cultural and religious norms that exist at the community level. “We are closely working with community members to address male dominance, gender inequalities, taboos and cultural norms,” says Hibret. Program staff are helping the community form peer-to-peer discussion groups where men are educated about factors that could affect their wives’ pregnancy, including poor nutrition. Another group who was identified by Born on Time as crucial to the success of the initiative are religious leaders. Priests and imams, are the most respected figures in communities where Born on time works. They have a key role to play “shaping attitudes, opinions and behaviors”, Hibret says, because people trust them. 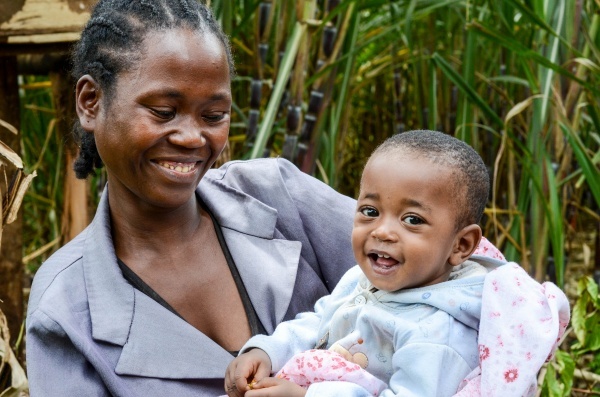 Through community involvement and strengthening of healthcare systems, Born on Time aims to improve mothers’ nutrition, giving their children a chance at a healthy life as a full-term baby. 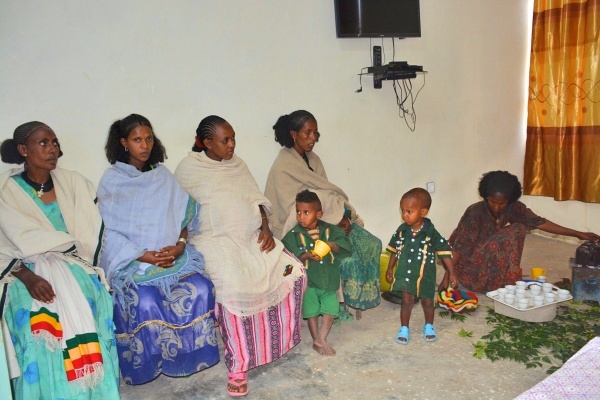 A group of pregnant mothers at an Ethiopian health centre. The caregiver is preparing tea for them. © 2019 Born On Time. All rights reserved.